My aunt brought this over from America for me last week, and I've not tried anything out from it yet but it looks fantastic! A little too heavy on the liquid smoke, perhaps (can we even get that in the UK?) but still amazing. I can't wait to try the chocolate-beer waffles! Yah. I get my liquid smoke from Let's Eat, because I like near their actual store. I don't mind liquid smoke.... but tbh, if it's a spiced dish I prefer to use chipotel (sp) pepper or something else smokey tasting in the first place. I was flipping through Vegan Brunch at the bookstore today, it looked pretty good. I also made the pesto scrambled tofu with grape tomatoes that I didn't really care too much for, and I normally love scrambled tofu. My fiance liked it though, so maybe it's just me. Overall though, it seems like a good cookbook and I'm looking forward to trying new things. If anyone has made anything that was good, let me know! I love this book! Today I made the swiss chard frittata. It was very tasty, both my husband and I liked it. I'll have to look for the coffee chip muffin recipe, that sounds really good. I am anxious to make the tempeh crab cakes. That recipe alone sold the book for me. mmm, saw the crab cake recipe on ppk website. Haven't had a chance to make it yet. Let me know how it goes if you give it a shot. I've made cornbread buiscuits with jalapeños and the english muffins so far and they were both really yummy. Isa is my favorite. I've just bought this book in London last week and I've already tried the old-fashioned Chelsea waffles. They're just great, but I missed the presence of sugar or anything else sweet. Maybe I just over-read that or my maple syrup doesn't work the way I want it. *shrugs* Gonna add some sugar next time. It also tastes of corn, very much. At first I thought I'm eating pop corn. xD However. Cuddly recipe. I'm gonna try the Tofu Omelettes and the scrambled Tofu as soon as I find chickpea flour and nurtitional yeast. (: I am so looking forward to it! I wanted something sweet today after I made one of the vcon lentil soup recipes and so I decided to make some "Perfect Pancakes". They tasted great, but the consistency was bad. It wasn't as steady (correct word?) as normal pancakes are. I've put the spatula under it and the already dried dough just broke. Does anyone understand what I mean? What did I do wrong and what can I do to make it more 'stable'? I followed the recipe a 100 %. I made the coffee chip muffins. They are delicious. I used silk unsweetened soymilk (as I do in all my baking) and decaf, organic, instant coffee. Otherwise I followed the recipe. got the book last week but haven't managed to make anything yet, might do so on the weekend. the recipes look easier and ingredients lists shorter than in vwav and vcon. ^opheliac, did you let the batter sit for a few minutes? I find that's essential for making good pancakes. Omfg, okay, I was hungry and I didn't let it sit for a few minutes. ^^"
Well, I made the tempeh crabcakes tonight. They tasted really good but tended to be crumbly. I'm not sure if I mixed them well enough or not. It seemed like a lot of bread crumbs to me but I followed the recipe. I didn't roll them in extra crumbs though as it already seemed like too much. If anyone else makes them I'd be interested to hear about the consistency of yours. I made tartar sauce to go with mine instead of the remoulade. But all in all, a success. They tasted similar to vegan crabcakes I've gotten at a restaurant. I am really loving this book. The other day I made the East Coast Coffee Cake. I did the raspberry chocolate chip variation. I honestly thought it was the best coffee cake I ever had. A few days ago I made Mom's Morning Casserole. We've been eating it every day as it makes a huge pan. It's really, really good. I also made the Cheesy Sauce that I used for a topping in place of store bought vegan cheese. My OH loved it, fondducoeur. He put it right into english muffins or toast that was buttered w/ earth balance and made "sandwiches" out of it. Today he even finished it off cold out of the fridge. Sounds like the batter didn't stay together, perhaps it was too dry? I don't have the book, so I haven't made them though. I hope they work out better next time! I got a copy of VCTOTW for my b'day but I already have it so my friend is swapping it for VWAV but now I think I should have said for her to get me Vegan Brunch, oops! The coffee cake sounds amazing! I made this casserole this morning and it was pretty delicious. I think next time I will use more potatoes and less of the tofu layer, but we both really liked it as is. I used the cheezy sauce (minus the mustard because I didn't realize we were out) on top, and it worked really well. Does that sauce reheat okay? I'm glad you liked the casserole. I really loved the potato layer as well. I basically don't measure stuff so I think I ended up using more potatoes than called for. When I made it I just dumped the whole pan of cheesy sauce right on top of the casserole so it kind of sunk in and settled there. Then when I reheated it really didn't look like a sauce anymore but you could still taste it. We actually both thought the casserole tasted even better the next day. I got the book yesterday and made the Basic Scrambled Tofu for breakfast this morning. OUT-FRICKEN-STANDING. I felt so skeptical of it too...the spice mixture didn't smell or sound very good to me...and nutritional yeast?!?!?! I doubted it up until it was totally finished and took a bite. I might have to go back and eat more right now. So good. Even my 3 year old ate it. just bought this in NYC. can't wait to use it! Tonight I made the sesame tofu scramble w/ greens and yams. It was really good. I used kale for the greens and sweet potatoes in place of yams. My husband loved it and he isn't keen on sweet potatoes. So I'm always trying to find new and different ways to make them. 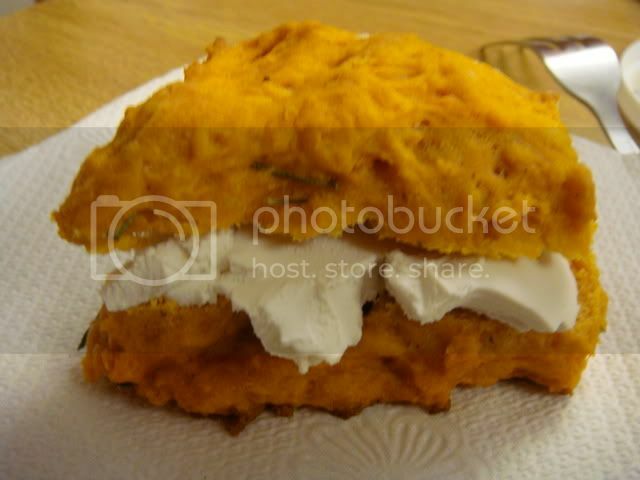 But he said that this recipe really disguised the sweet potato taste well...haha. Really though, everything I've made from this cookbook has been a hit. My copy should arrive this week but a friend shared some recipes with me and I made the Polenta Rancheros (awesome), the Fennel Breakfast Risotto (delish) and the East Coast Coffee Cake (yum). We have not made anything from ours yet. Any recommendations? All of the three things I made were deeeeelish! Other people have loved the cinnamon rolls, the English muffins, the scrambles and omlettes. Everything I've made from this book (see above posts) has been delicious. The East Coast Coffee Cake I've made 3x. First w/ chocolate chips & raspberries, then w/ bananas & chocolate chips, and most recently w/ cinnamon and figs. Today I made the tempeh sausage pastry puffs. My husband and I have already eaten 4 each. So good! It's the first time I ever used puff pastry. I also made the smoothies supreme. Best berry smoothie I've ever had. Using frozen bananas really makes a difference. BB, if you are interested in a yummy recipe that makes a lot, I'd recommend the Mom's Morning Casserole w/ the Cheesy Sauce. We ate that all week. I made the tomato rosemary scones yesterday. They are such a pretty color and yummy as well. We had them w/ soup. The dough was very sticky when I turned it out to knead it and I had to add a considerable amount of extra flour. I am beginning to wonder what I ate before I got this cookbook. Over the weekend I made the Puttanesca Scramble, Potato & Spinach Squares, and the Banana Rabanada. They were all so, so good. I will be making them all again. I might make more of the tofu dish today b/c I have a lot of the potato squares left over. It makes a big pan (but that's a good thing ). I highly recommend all those dishes. And Isa is right (of course), the puttanesca and the potato squares really compliment each other nicely. I have had and loved this book for a while, but have recently made a few things that were really good. New Years day I made the chesapeak tempeh cakes w/roulade and the shiitake dill frittata. Both were so good! I think I liked this frittata variation better than the swiss chard one, which I had made several times. The tempeh cakes were so good. They were a little crumbly as vegan witch mentioned earlier in the thread, but not too bad. Today I made the breakfast risotto topped with smoky shiitakes. I also fried some fakin tempeh bacon with it (lightlife). The risotto was very good, especially with the smoky mushrooms and tempeh. Other things I have made in the past are the roasted butternut squash, scrambled tempeh, choc. chip espresso muffins, mom's morning casserole and a tofu omelette w/broccoli rabe & capers. It has pretty much all been super good. I have this book great recipes that actually taste good. It inspired me to buy a waffle iron, which I broke after making my first batch D: I made the choc beer waffles and they were truly awesome. They all sound really good, let us know how you get on with the Crepes! I have only made a few things from Vegan Brunch but they have all been brilliant. I have made Italian Feast Sausages, French toast and the hash browns (the hash browns were a little grey but still tasty). I made the cocoa and raspberry muffins from Vegan Brunch today, they were lovely. I followed the recipe exactly, except for the almond extract, and used frozen raspberries. I also have my eye on the coffee cake and its variations. Seems like a really good book, the idea of 'brunch' translates for me as a lazy weekend breakfast and I love that type of food!